Note: You can enter this giveaway one (1) time per e-mail address per day. Deadline is 11:59PM ET 11.29.18. 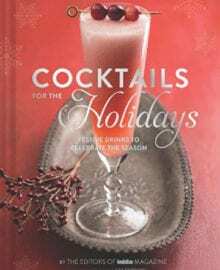 Ensure that your holidays are filled with good cheer with help from the editors of Imbibe Magazine. Whether you’re planning an intimate gathering or a grand soiree, the fifty recipes from bartenders across the globe will keep things festive. Warm up with a Highland Toddy or Hot Buttered Cider, or sip on a Spiced Pear Daiquiri or Kumquat-Cardamom Sidecar around the fireplace. Celebrating the holidays with friends and family has never been so tasteful. Even more soothing sips can be found in Classic Cocktails Recipes slideshow; old-fashioned holidays call for an Old-Fashioned Cocktail after all. NO PURCHASE NECESSARY TO ENTER OR WIN. Void where prohibited by law. Open to legal residents of the 50 U.S., D.C. and Canada (excluding Quebec) who are at least eighteen years old at the time of entry and have internet access. Begins on 11.8.18 at 12:00:00 a.m. ET and ends on 11.29.18 at 11:59:59 p.m. ET. To enter this giveaway, submit your full name and email address on this form. Odds of winning this giveaway depend on the total number of eligible entries received. Only one (1) entry per email address per day. Sponsored by Leite’s Culinaria, Inc. For more information, visit our Official Rules. For a list of winners, check out our Very Happy Winners page. Be sure to add giveaways@leitesculinaria.com to ensure notification if you are the winner.